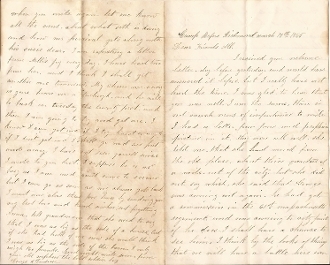 Soldier's Letter, 4 pages, 8vo., Camp Before Richmond, March 17th, 1865. George A. Gardner (Co. H, 17th Massachusetts Infantry, also served on Co. B, 2nd MA Heavy Artillery) writes pertaining to Virginia Overland campaign. "...General Sheridan has been doing well for the past few days. He camped his army within three miles of Richmond the other night. He destroyed the bridges and tore up forty miles of the Weldon Rail Road and captured twelve canal boats that were loaded with supplies for the enemy and captured some hundred of prisoners..."
For full discription of the letter, please see the scan. Some aging otherwise very fine and legible.